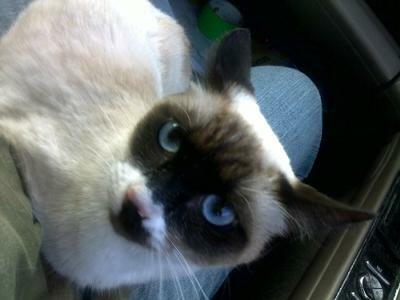 We were looking for our lost boy, a Siamese named Riesling - "Rez" - and got a phone call about a cat matching his description a few miles down the road. When we got there, I saw her boots and knew it wasn't him, but they offered her to us anyway. They explained she had come out of the corn field about a week before and only their grandson had really been able to get around her. She looks like someone's pet, and we are actively looking for her family. She has a red eye shine and chocolate points, but her legs have a bit of striping and she has white blotches around her mouth. All four of her feet have white mittens but the pads of her feet are both pink and black, like I've seen in tortoiseshells. 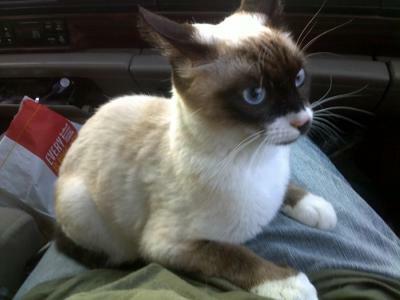 She certainly sounds like a Siamese and has an attitude to match. She loves nuzzling people she knows but she hates everyone else. She's very talkative, which is surprising since I really thought our boy was, until I compared him to her. She really doesn't stop! By the way: Rez reappeared after a night of leaving her outside. Apparently, women are his weakness! First, Tashia, I'm so pleased that Rez turned up. It's awful when cats go missing, I know that feeling. And what an unusual cat you found! 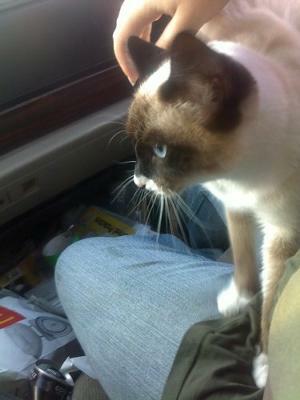 Certainly a Siamese mix, she looks quite like a Snowshoe, also known as a Snowshoe Siamese. Steps to take for trying to trace the owners could include having the cat checked for a microchip (vets can do this), contacting all the veterinary clinics in the area in case anyone has reported their cat missing, and talking to the local animal shelters, including any Siamese or other pedigree rescue centers. I do hope you find her owners. Otherwise, perhaps she might find a new home with you? Rez obviously wouldn't mind! After looking for Rez, it was a lot easier to post information around about a found cat! 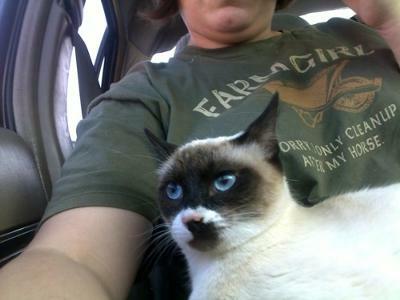 It's been a few days now and no one has contacted us about her, nor does she have a microchip. She does have jerky nystagmus, but it only shows when she is stressed. She bobs her head sometimes when she walks around in a new area. She loves people once she gets to know them, but otherwise would prefer to be left alone. It's sad, but we're fearing that she may have been dropped off in the country. :( If that's the case, she's more than welcome to haunt our home... She just hates Riesling trying to nuzzle and be around her!